If there has ever been "A year" in recent times for making gifts, this would have to be it. I've perused the magazines, websites and blogs and these are the batch of goodies I am whipping up for some lucky boys and girls this year. 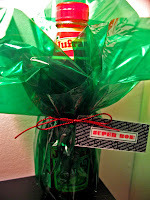 Another tactic I am using this year is wrapping some of my favorite "Super Bon!" food items in festive cellophane as gifts. Most of these items are all under $10 and a fine addition to any food lover's cupboard. Italy's Amalfi Coast and adjoining Sorrento Peninsula are the regions most famous for this intensely lemony liqueur, traditionally served ice cold as an after-dinner drink. Here, it is enhanced with a subtle note of rosemary. Prep and Cook Time: about 1 1/2 hours, plus at least 2 weeks and up to 80 days of infusing time. Notes: Either Meyer or Eureka lemons work in this recipe (the fragrant Meyer is especially good, though). To speed up the process, shorten the infusing time in steps 2 and 4 to 1 week each, and you'll have a fine although less intense liqueur. Limoncello keeps indefinitely in the freezer. 1. Peel lemons with a microplane or sharp peeler, taking only the zest (top layer) and avoiding any white pith. Put rosemary in a 1-gal. glass or ceramic container with a tight seal. Add zest to jar. (Juice the lemons and freeze for future use). 2. Pour 750 ml. vodka over rosemary and zest; seal container. Let sit undisturbed in a cool, dark place for 40 days. 3. In a saucepan, bring 5 cups water to a boil and add sugar. Cook, stirring, until sugar has dissolved. Let sugar syrup cool to room temperature, about 1 hour. 4. Pour syrup and remaining 750 ml. vodka over lemon-vodka mixture, stir, and seal container. Let sit in a cool, dark place for another 40 days. 5. 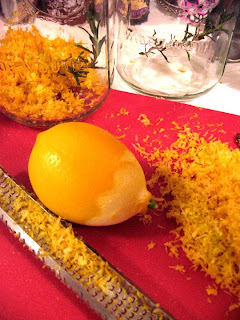 Pour limoncello through cheesecloth into a large spouted pitcher and divide among gift bottles. 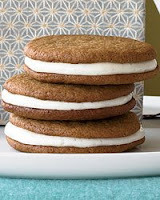 World-renowned pastry chef Nick Malgieri adds a puckery note to his gingersnap cookies by sandwiching them with a fresh lemon cream. Make the cookies: In a bowl, whisk the flour, baking soda, ginger, cinnamon and salt. In the bowl of a standing electric mixer fitted with the paddle, beat the butter and sugar at medium speed until fluffy, 3 minutes. Beat in the egg and molasses. Add the dry ingredients and beat at low speed until incorporated, scraping down the bowl. Make the filling: In the bowl of a standing electric mixer fitted with the paddle, beat the butter with the confectioners’ sugar at medium speed until light and fluffy, about 3 minutes. Beat in the lemon juice. The beauty of pistachios are their diversity. So to flavor them, don't be afraid to get creative with the ingredients.. You're not limited to "chili-lemon". Bourbon-maraschino.. tequila-black pepper-lime.. salt & vinegar.. cayenne-clementine... (liquid) smoke-cinnamon!? Get nutty. 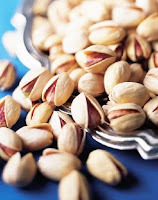 Start with bulk pistachios. First dry the nuts a little more than they are when you buy them. To do this, put them in a large pot in the oven on low heat for a few hours. After that add about 1/2 cup of Kosher salt per 5 pounds of nuts, spices or liquors to season them, and then water to dissolve the spices (no water if liquor). Let them soak for 2 or 3 days to absorb the flavors, agitating them at least once a day and adding more liquid or spices if the nuts dry. The nuts will be soggy after this. Then roast them by putting them in an oven with as much surface area as possible in contact with the air and dehydrate them at about 150 - 200 deg for 4 - 5 hours. Then roast them at about 300 deg or slightly more for about 1/2 hour to 45 min. It helps to spray them with olive oil, or butter. This brings out more nutty flavor.